A very solid rifled slug, that offers the best of both worlds. Devastating performance, and amazing accuracy at long ranges, as well as lower recoil than other rounds that are similarly composed. 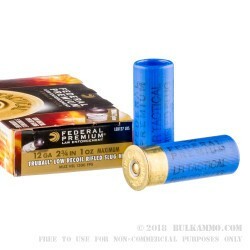 The 1 ounce rifled slug is a hard hitting projectile that gives accurate kills at ranges between 50 yards and 125 yards out of a smooth bore. 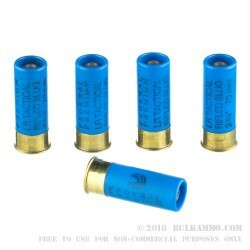 Ideally suited for hunting large game at distances between 25 yards and 75 yards, this is no doubt a fast and lethal 2 ¾ “ shell. Wild deer and home invaders both have adequate reason to fear the implications that an accurate rifled slug delivering 1600 ft. lbs. of energy and 437 grains of solid lead on target might be able to deliver. 1300 feet per second velocity and realistic accuracy out past 75 yards makes this a perfect round for a plethora of shotgun needs. 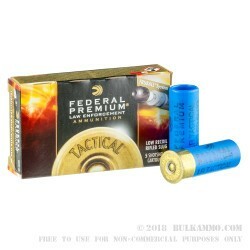 Though the price is steel compared to #8 target loads, the facts present that this is a significant discount to other slugs in the same category or those that are of substantially similar quality. 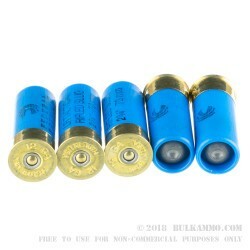 With the reduced recoil, and the type of performance that you get for the money out of a 2 ¾” shell, this is no doubt, a contender for your next hunting or self-defense slug.